Let’s face it, SHOT Show is where it’s at. This past one is being named as one of the best in history. 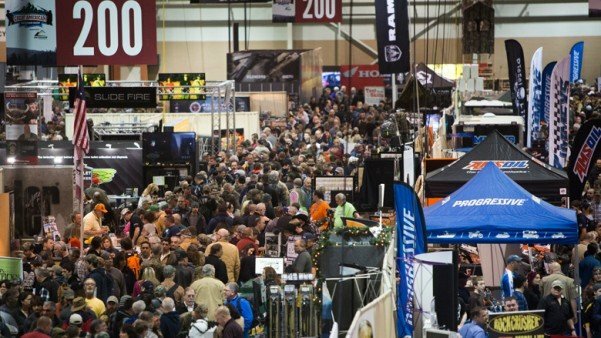 If you missed it, however, maybe you can make the next big outdoor show in Harrisburg, Pennsylvania the second week of February. Technically speaking, The Great American Outdoor Show is the biggest outdoor show in the country. Taking place from February 6-14, the show is put on by the NRA and has many HUGE sponsors, like Cabelas. There will be 1,100 exhibitors that range from firearms and ammunition manufacturers, to truck and RV makers. All in all, it covers 650,000 square feet, has a country radio concert and comes with a stocked pond, just in case you feel like doing some fishing. Hundreds of awesome exhibitors will be in attendance. Some of them are even selling stuff (though, I don’t believe any guns will be sold during the event). Bow hunting? Yeah, there’s some of that going on too. Well, not actually hunting but target shooting. The Great American Outdoor Show is also a hot-spot for outdoor celebrities like Jase Robertson (Duck Dynasty), Stone Cold Steve Austin, and more professional hunters and fishermen than I can name here. Finally, the famous Wall Of Guns is back for another year. Basically, you pay $10 for a ticket and are entered for a chance to win one of the guns encased in the wall. After every 100th ticket is sold, they do a drawing. For more information about the exhibitors, celebrities, other cool stuff going on at the show, and to register for tickets—make sure you check out The Great American Outdoor Show’s website. It may not be SHOT Show, but it is the next best thing.